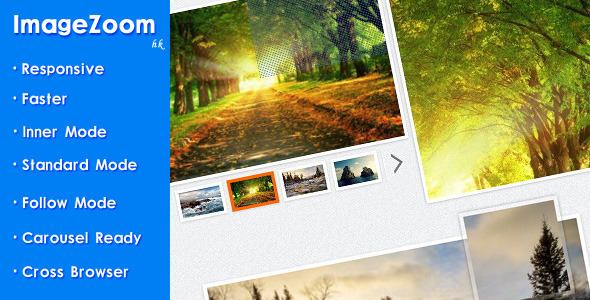 ImageZoom is a jQuery plugin for image zoom effect. It has thrid mode of image zoom effect : inner mode,standard mode and follow mode. It is easy to use, you can just use single image or set a large image. When you set a large image you view see itâ€˜s 4~10 faster than other to show zoom view (witch use image load event to get the large image width/height ). You can try the the imgfast demo in the live demo page to see it. And ImageZoom is ready to use with an carousel. It has a lot of options and method witch let make what just need.